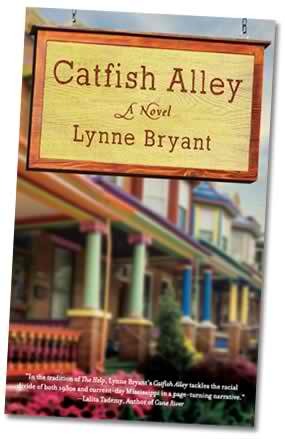 Catfish Alley is Mississippi-born Lynne Bryant's first novel -- and in reading it, I feel as if I've stumbled upon a rare gem! Flashing back and forth between present-day and 1920s-1930s Clarksville, Mississippi, Catfish Alley is a story that puts racism and deep friendship to the test. The novel explores racism and segregation that is still very much present in the South, no matter what people these days are made to believe. Being a Biloxi-born Mississipian myself, I can completely understand and appreciate the complexity and beauty of Catfish Alley . Roxanne Reeves is a white woman with a highly-coveted social standing who is asked to work on a project that covers African-American history within Clarksville for a touring of Antebellum Homes. For help with her special project, Roxanne meets with elderly Grace Clark, a retired black schoolteacher who has spent nearly her entire life in Clarksville and has witnessed and survived many a heartache throughout her years. While at first Roxanne is slightly put-off and uncomfortable with the project, she finds herself being irresistably lured in by Grace's stories about Clarksville and soon begins to question and explore her own feelings regarding Grace and her friends and racism in general. Readers can pretty much guess from the synopsis how the story ends; Roxanne and Grace become friends for life and Roxanne steps out of her comfort zone and into the other side of the rainbow, so to speak. But, this is not all that happens and the book's journey is very well worth the ride. In addition to Roxanne's self-development, readers are drawn in to the mystery surrounding Thomas "Zero" Clark, Grace's loving and charismatic older brother who befalls his own tragedy in 1931. Catfish Alley is told from the viewpoints of several different characters and has an EXTREMELY captivating story that unfolds and will keep you hooked until the very last page. I had a difficult time putting this novel down and I can't wait to let the rest of the world know about it. My final words on Catfish Alley are regarding my emotional involvement with the novel. While Roxanne was not my favorite character by far, I appreciated her transformation. In the beginning, I really had to bite my tongue and grit my teeth when her snooty, white, high-society acquantainces kept referring to "blacks"-this and "blacks"-that without any interjection from Roxanne. This novel may bring the more sensitive readers to tears, but overall is a pleasurable experience. I am looking forward to Lynne Bryant's future work and I truly hope Catfish Alley gets the high praise it deserves.